George Mallory, the English mountaineer who took part in the first three British expeditions to climb Mount Everest in the early 1920s, was once asked "Why do you want to climb Mount Everest?" to which he answered, "Because it's there." Making soap with beeswax is kind of the same. Beeswax adds some hardness to the soap bar, but too much in the soap recipe causes "drag" on the soap and reduces the lather. Plus, there are other ingredients that you can use/add to still get a nice hard bar of soap. You can also add beeswax to combat ash in your soap recipes. And there are some unsaponifiables (not affected by the lye) in beeswax, but nothing that's really going to be special for your skin. So why use it? Well...other than "because you can" or "because it's fun to try new ingredients in soap recipes," by far the best reason to incorporate beeswax into your soap recipe is the label/marketing appeal. It just sounds cool to have beeswax in your soap - it sounds natural, and beeswax connotes warmth and hard working bees and the scent of honey. So let's make a batch of soap using beeswax as one of the ingredients. And while we're working with the beeswax theme, we'll add some honey too, and use a mold technique to make the top and bottom of your soap look like a honeycomb. With the beeswax, you can use anywhere between 1% and 3% of your total oils. Be sure to include it as one of the oils in your recipe when you are calculating your recipe. 2 ounces of fragrance or essential oil - but be sure to use one that you know will not accelerate trace! Beeswax (and honey, to a lesser extent) tends to really accelerate trace - so we've got to add the ingredients a bit differently than we normally would. But first, we're going to include a neat mold technique that goes along perfectly with our beeswax theme. Here is a mold technique that you can use on any soap recipe, but it seems just perfect for a recipe that uses beeswax and honey. Cut two pieces of bubble wrap the same dimensions as your soap mold. Place one of them on the bottom of the mold, with the bubbles facing up, and save one for the top. It will create a nifty honeycomb pattern on the top and bottom of the soap. It's purely aesthetic, but while were going on the beeswax and honey theme, let's go for it! 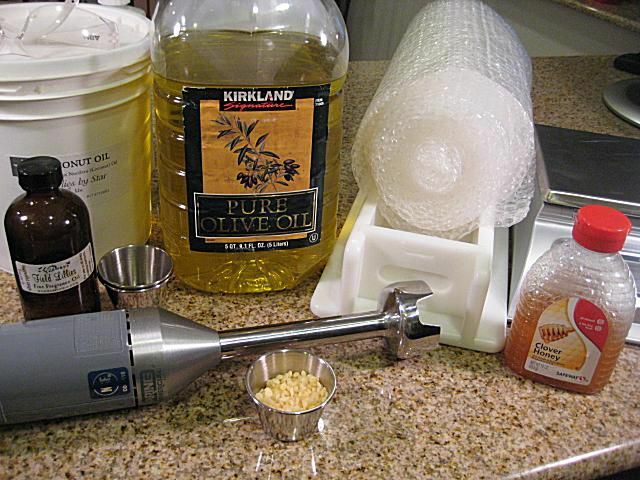 Measure out and begin to melt your soap making oils like you would in any other cold process soap recipe. However, the melting point of beeswax is about 145° (F), so you're going to have to bring your oils to a higher temperature than you normally would. And then let them cool back down. Once your oils are heated, add in the beeswax and stir well until it's completely melted. If you don't want to wait for your oils to cool down by themselves, you can cool them in a water bath by putting your soap pot into a few inches of cool water in the sink. You'll start to see the oils start to solidify around the edges of the pot. Just stir the oils to keep them melted. Once the oils are down to about 120°, take them out of the water bath. That's about as cool as you can go without the oils starting to thicken. Normally, you would just add the honey at a light trace. However, because we know that the beeswax is going to accelerate the trace, we're going to add the honey to the soap oils before we add the lye. Separate out some of your soap oils and add the honey. Blend it in well. Because the honey is water-based, it's not going to blend completely with the oils...but do the best you can with a few blasts from the stick blender. Add the honey-oil back to the pot and blend the whole mixture of oils, beeswax and honey very well. Because you're working with a wax that wants to harden, and honey, which wants to separate out from the oils, you want to make sure the whole mixture is very well blended before you add the lye. With the oils, beeswax, and honey blended well, it's time to go. Add your lye to the oils and stir gently - just with a spatula or the end of your stick blender. You'll see it start to thicken right away...even not turning the stick blender on. After you've stirred the soap a minute or so, and the lye and oils are well blended, slowly add your fragrance oil and give the soap a few short blasts with the stick blender. This will probably be all you'll need to get to trace - and your soap will be ready to pour into the mold. Once your soap is poured into the mold, cover it with the other piece of bubble wrap you cut to the size of the mold, with the bubbles facing towards the soap. Make sure the bubbles are pressed down fully into the soft soap. Super Hot Gel Stage in the Soap Mold! The combination of beeswax and honey is going to give you a super hot, full gel stage in the mold. Here is the soap after about just 45 minutes or so. It's nearly 200° (F) at the center! Sometimes in super hot gel stages like this, you'll get a layer of oil on the top of the soap. It will seem like the soap is separating. I've found that just leaving it alone is best. The oil will re-incorporate back into the rest of the soap as it continues to saponify and cool. That happened with this batch - and it was gone by morning. After that super hot gel stage, all should be cooled down by the next morning. Pull off the bubble wrap, take the soap out of the mold, and cut it. You can see the cool honeycomb pattern/effect created by the bubble wrap. Here's the finished soap cut into bars. The honeycomb pattern is on the top and the bottom of the bar of soap. You could choose to just have it on one side by not using one of the pieces of bubble wrap. So...was it worth it to go through the extra trouble and steps to use the beeswax? You'll have to be the judge of that. As for the label appeal, you can't beat it. And like many of the soap making techniques, ingredients and methods - it's always fun to try something once!